"A farmhouse freshly interpreted for today's lifestyle." Farmhouse Redux in Cabin John - Authentic Simplicity Meets Green Design at its Best. This is the kind of house that a meticulous, award-winning builder builds for themselves. The design is thoughtful and the execution is at a level not often found. Inspired by a 19th century farmhouse, but a farmhouse like no other. Case in point — true to the farmhouse style, there are no crown moldings requiring that the house be precisely crafted to a higher standard. Throughout the main floor, nothing is left out and everything is on a larger scale. High ceilings, large windows, airy spaces abound while every room you might want is waiting for you. The kitchen was designed to the specifications of a professional chef and includes a who's-who of professional grade appliances including an AGA range that embodies the farmhouse authenticity. There is a breakfast area and a study nook alongside the kitchen. Plus, a private study/office awaits the working professional. 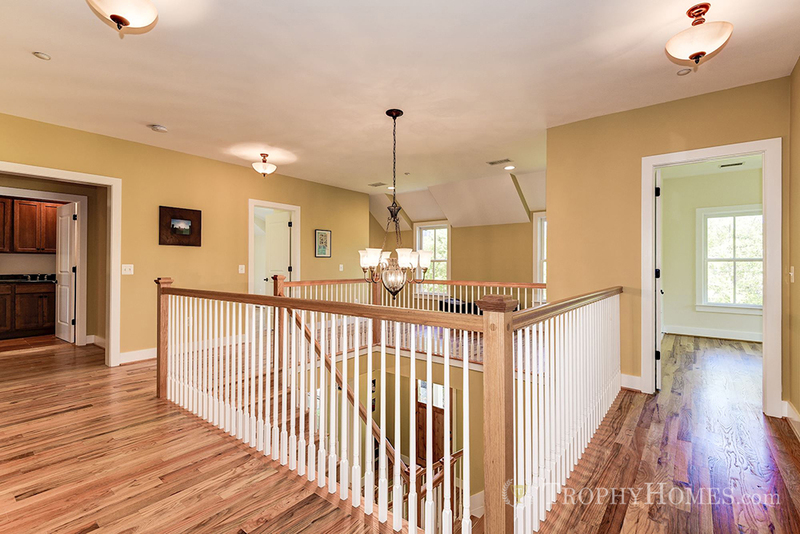 Stained 5 ½-inch “farmhouse style” oak strip flooring flows from room to room. The dining room is open and welcoming for an intimate evening with family and friends or a large gathering of guests. There is a living room with room to accommodate a baby grand piano, a family room with a large dry-stack stone-faced fireplace. 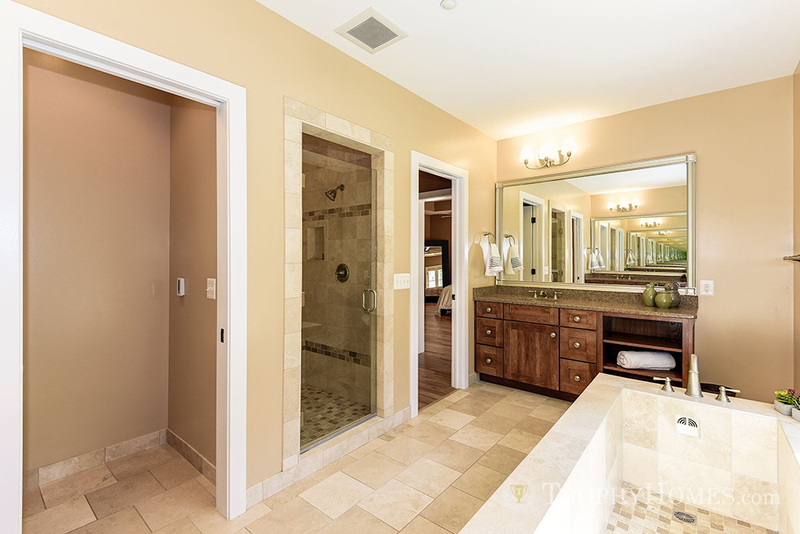 Upstairs, the owner's suite is a private retreat with a vestibule entrance, high ceilings and sound-buffered walls. An oversize walk-in closet features fully adjustable hanging space and shelving. Double French doors lead to a private balcony with Virginia views. 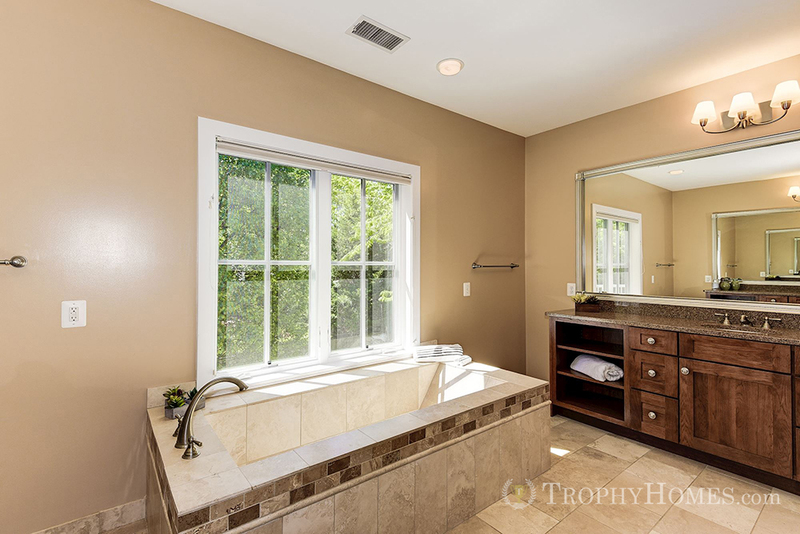 The owner's bath features an oversize, two-person Roman tub, heated floors, and separate shower with built-in bench. A large common area separates three additional bedrooms with baths. Separate stairs from the main level lead to a fifth bedroom with en-suite bath — perfect for an au pair, or guest accommodations. Green Inside, Green Outside, Green Everywhere. Geothermal technology is used to heat and cool the house, taking advantage of the Earth’s relatively moderate and constant temperature by using a water-based “closed loop” system. This makes the entire heating and cooling process significantly more efficient. 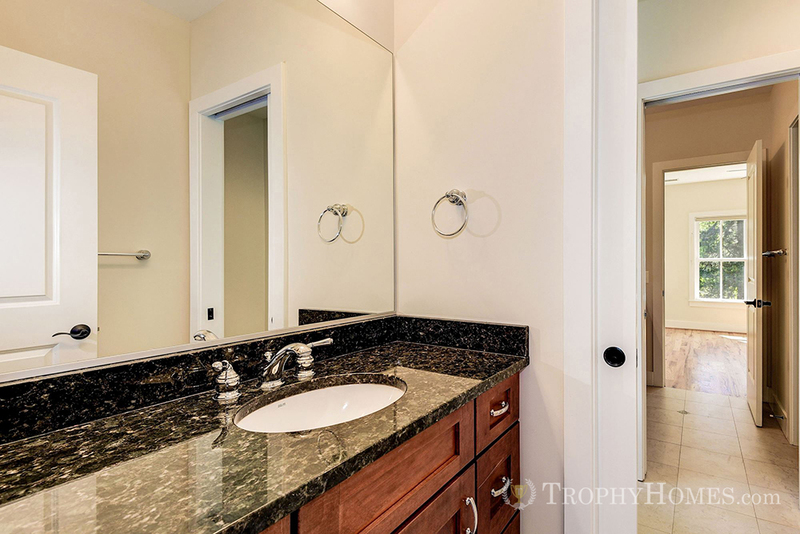 Another green feature is the installation of dual-flush toilets. Many of the additional green elements are behind the walls, having to do with the house’s construction techniques. The rear porch is screened and open to the large backyard, and includes a wood-burning fireplace to add comfort on chilly spring and fall days. The rear yard is fenced on all sides with cedar planks. The two-car garage is insulated and provides extra storage space. Cabin John is a perfect neighborhood for families — quiet, safe, and friendly. Kids attend Montgomery County public schools including coveted Walt Whitman High School. The neighborhood is also home to Clara Barton Community Center and Cabin John Park, which has several sports fields and a playground. And the C&O Canal and the wilds of the Potomac River are only minutes away by foot. Cabin John homes are an eclectic mix of old and new, large and small. You can walk to Wild Tomato, located in the middle of the neighborhood and featuring wood-fired pizza and new American cuisine. Another standout local amenity is the Bethesda Co-op, a large, old-school natural foods grocery. Cabin John is literally minutes away from everything. Downtown in 15 minutes away on the Clara Barton Parkway, Bethesda is 8 minutes' drive and Tysons Corner is a 10-minute hop on the Beltway.